The Fullers Earth is used to adsorb soluble contaminants such as gums, resins, waxes and acids from fuels, oils and solvents. Carbon elements are used for the removal of color and odor from potable liquids such as water, vegetable oils and mineral oils. 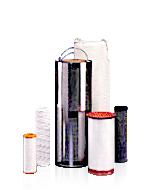 Adsorption elements are not intended for filtration. However, due to thier construction, they provide filtration down to 5 micron in the Fullers Earth elements and 1 micron in the Carbon elements. These elements are limited to 300° F and 50-80 PSIDP differential pressure. The prime use of Fullers Earth elements as in the removal of acids in oil reclamation and surfactants in aviation fuels. The largest use of Carbon elements is in the purification of water.